Graphene is a single-atomic carbon sheet with a hexagonal honeycomb network. Graphene’s electrons take a unique electronic state, referred to as Dirac-cone, where they like they have no mass. This enables them to move rapidly, and gives graphene a high electrical conductivity. The flow of electrons without mass and resistance in graphene is significant as it demonstrates potential for a futuristic high-speed nanoelectronic device. Crystal structure of Ca-intercalated bilayer graphene fabricated on SiC substrate. Insertion of Ca atoms between two graphene layers causes the superconductivity. 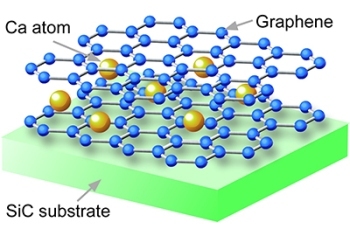 A team of researchers from Tohoku University and the University of Tokyo have created a technique that controls to number of graphene sheets to grow superior quality graphene over a silicon carbide (SiC) crystal. After fabricating bilayer graphene, calcium (Ca) atoms were sandwiched between the two graphene layers. Using the micro four-point probe technique, they measured the electrical conductivity and discovered that at about 4 K (-269°C) electrical resistivity rapidly drops, which suggests the emergence of superconductivity. The researchers also observed that lithium-intercalated bilayer graphene, as well as genuine two-layer graphene, did not show superconductivity. This suggests that the electron transfer from Ca atoms to graphene sheets caused the superconductivity. The successful fabrication of the superconducting graphene could also influence both the fundamental and applied research works of graphene. At this point it is still not clear what happens when the zero-mass Dirac electrons show superconductivity, but the data from this research, as well as further experimental and theoretical studies, will help to reveal all of the features of the superconducting graphene. The superconducting transition temperature (Tc) analyzed in this research on the Ca-intercalated bilayer graphene is still low (4 K). Therefore further research is required to increase Tc, either by modifying the number of graphene sheets, or by substituting Ca with other metals and alloys. The latest results aid to promote progress in the field of ultrahigh-speed superconducting nano devices, such as quantum computing devices, which require superconducting graphene in its integrated circuit.